Play as both Captain Noodles and his crime-fighting partner Ceiling Fan Man in their journey to stop Major Mayonaise and Smelly Grape Jelly. Attain weapons and annihilate enemies with the Magic Muffler and a sandpaper-wrapped wooden dagger. Drive vehicles such as high-performance exotics and star-cruising spaceships. Travel the game world from places ranging from local Noodle Land locations, to the deep jungles of Bodecambia, and even to the moon. 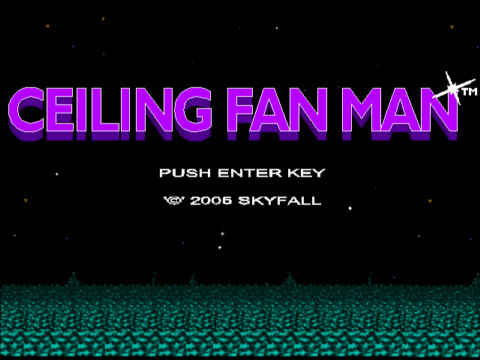 CFM1 is the project that started SKYFALL Games. Gameplay consists of linear room-by-room challenges (with difficulty selection at the beginning) and is heavily story-based. This game has an amusing storyline that combines classic SKYFALL mentality, many video game clichès, and a touch of intricacy. Although, in complete, blunt honesty, this game is not the most fun to play at first, but we promise that around Mission 3 you will start having more fun. This is due to lack of programming knowledge. Afterall, this was the first video game project we've ever started. It is interesting to watch how we learn more and more complex programming as you play through the game. Mission 3 is where we figured out a way to program a weapon, for instance, so until then you won't even have one. Hover mouse pointer over a screenshot for a description.